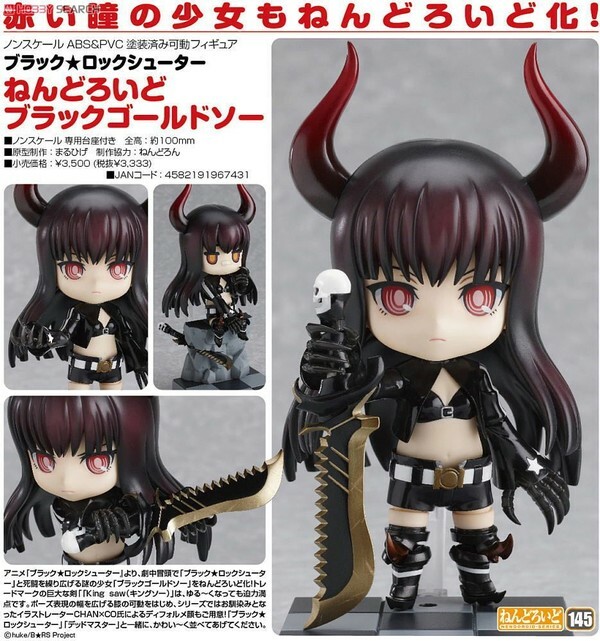 Summer of Doom- for my wallet. 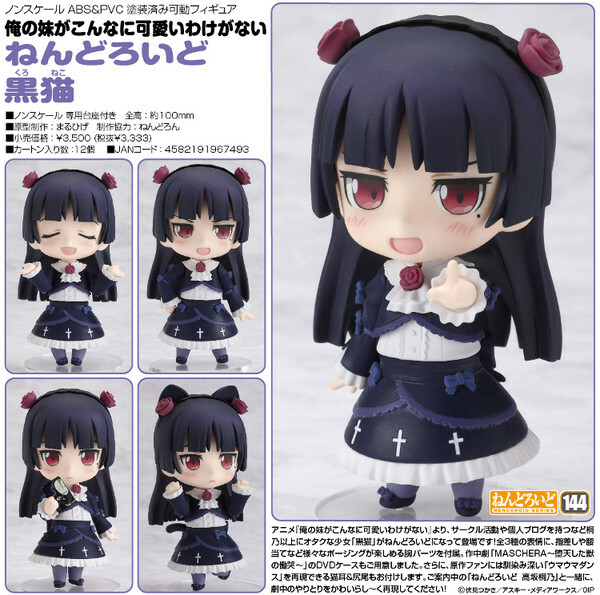 This upcoming summer will be the summer of doom for my wallet! 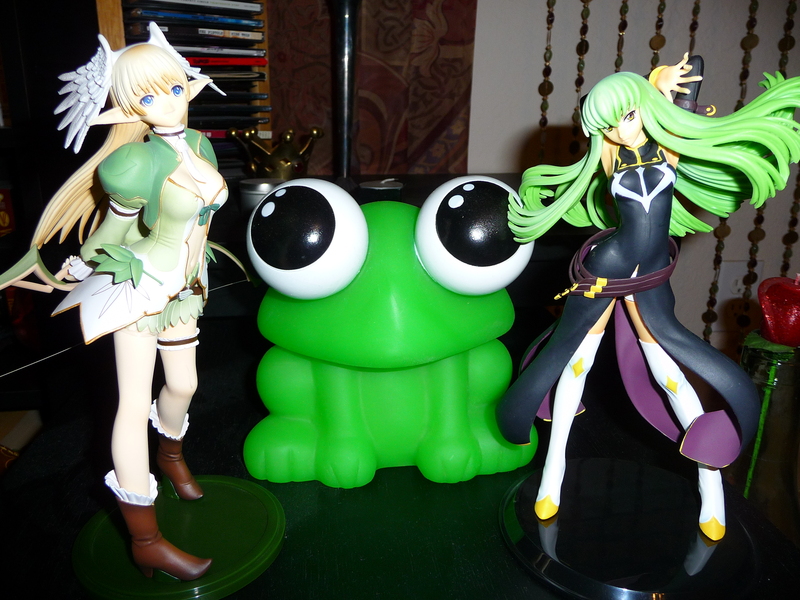 Last year at A-kon 21 I spent nearly $230 on loot. 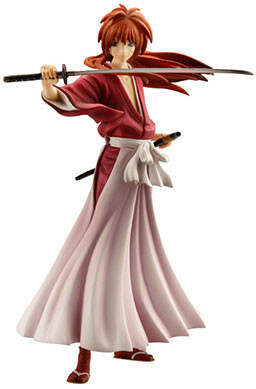 Play Arts Kai Cloud: 06/2011, $60. 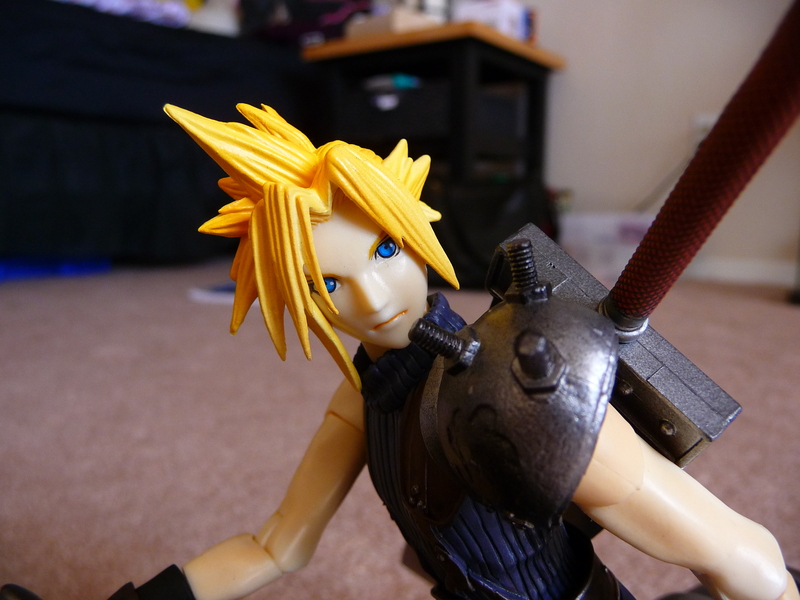 I must have this toy, I love Cloud! 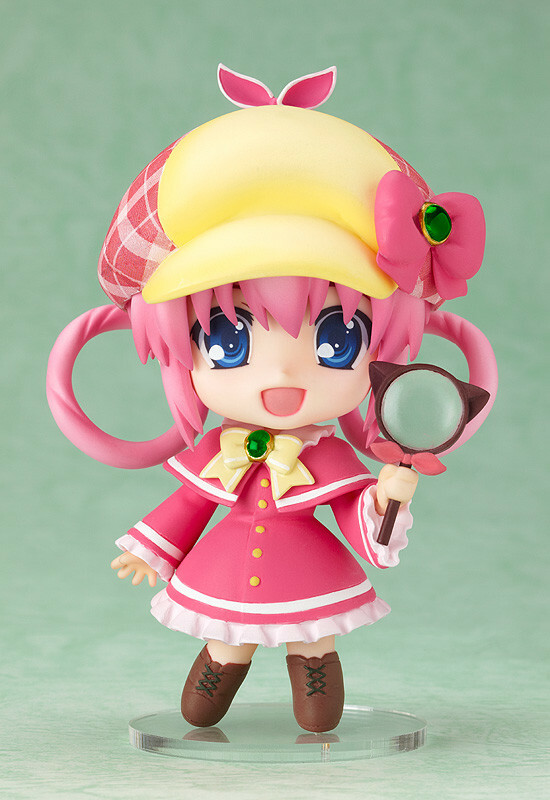 Sadly, I’m choosing to forgo nendoroid Haru-chan who will be released 4/2011, and nendoroid Sherlock Shellingford who will be released in 7/2011. 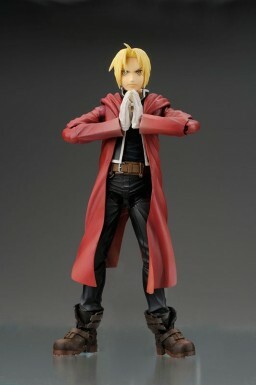 Play Arts Kai Edward Elric, Roy Mustand, and Alphonse Elric which were released back in 10/2009. 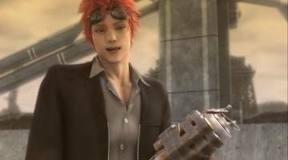 Reno is one of the Turks (a group of Shinra covert operatives) from Final Fantasy VII and FF7 Advent Children. 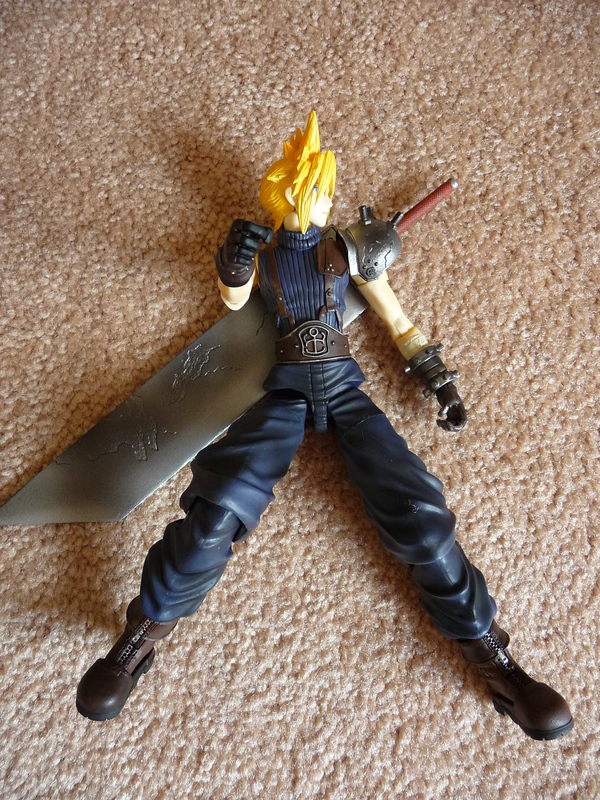 During FF7 he is an enemy to Cloud and the main group, however in Advent Children, he aids Cloud in his fights. He is a cocky, cynical, somewhat lazy, and at times just goofy character. 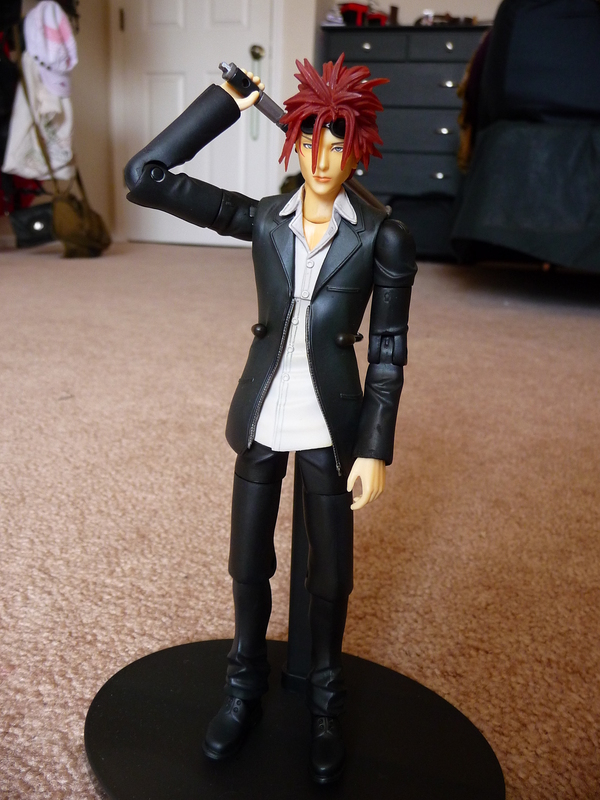 I got this Play Arts figure for free! 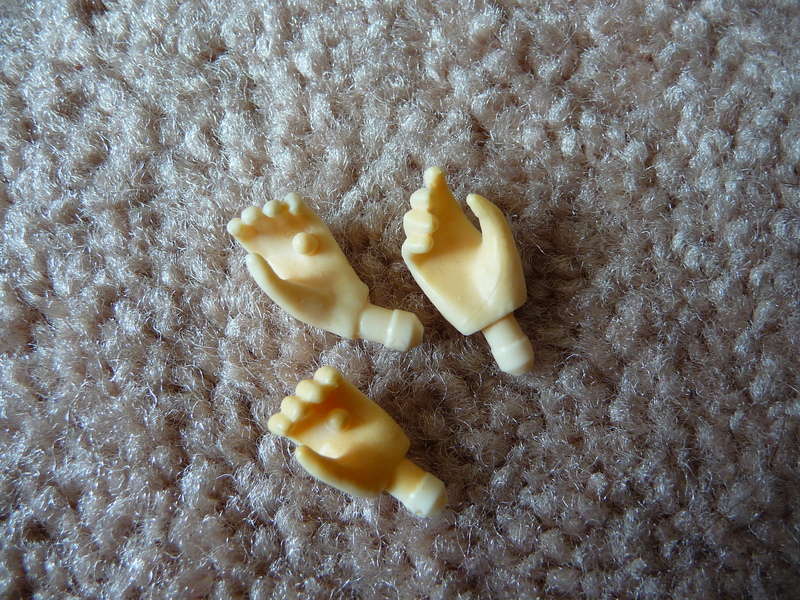 Yes for free, because his head was detached, luckily with some effort, the shop owner was able to pop it back in for me. It’s not super sturdy, but it stays if I don’t move it around much, and I don’t want to glue it. 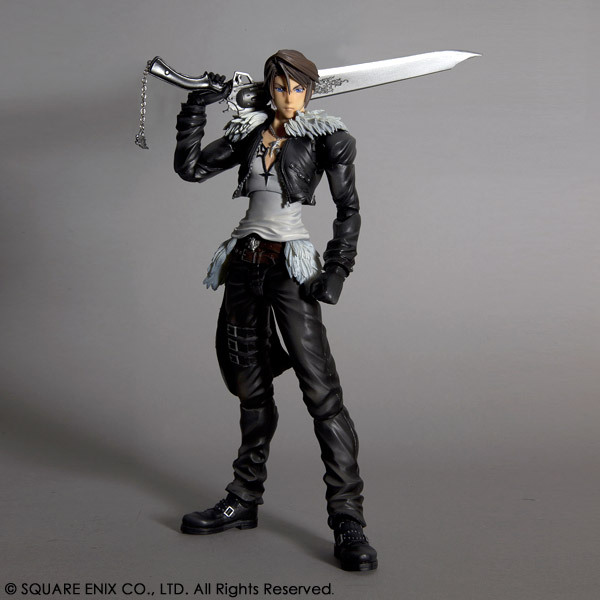 and without further ado: this is the Final Fantasy VII: Advent Children Play Arts Reno. 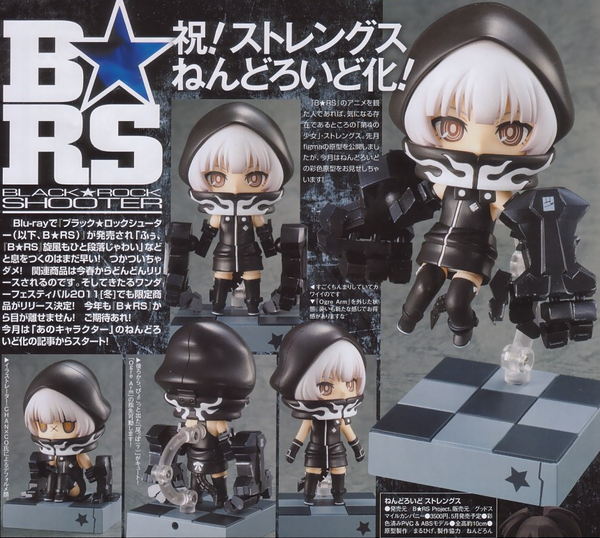 It was released in 10/2007 and was manufactured by Square Enix. 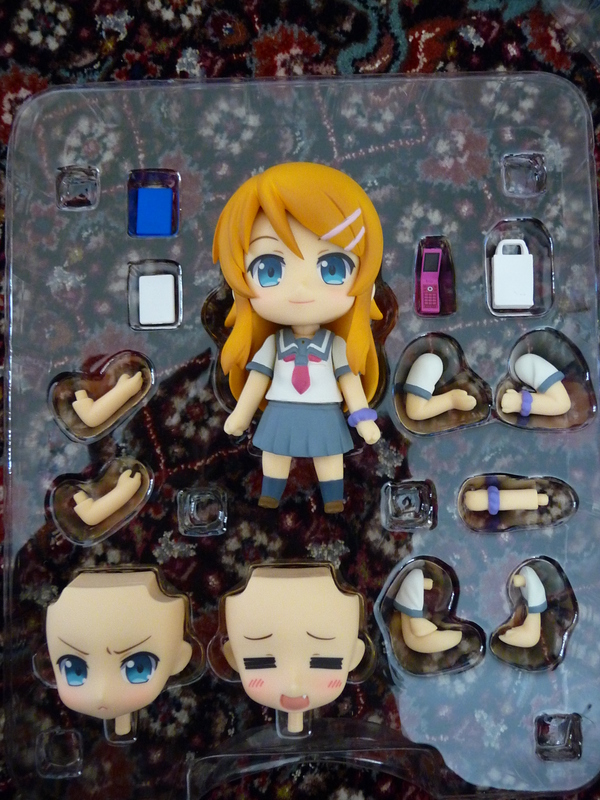 Packaging: Well I didn’t take any pics of the box, was too lazy to dig it out of the storage. 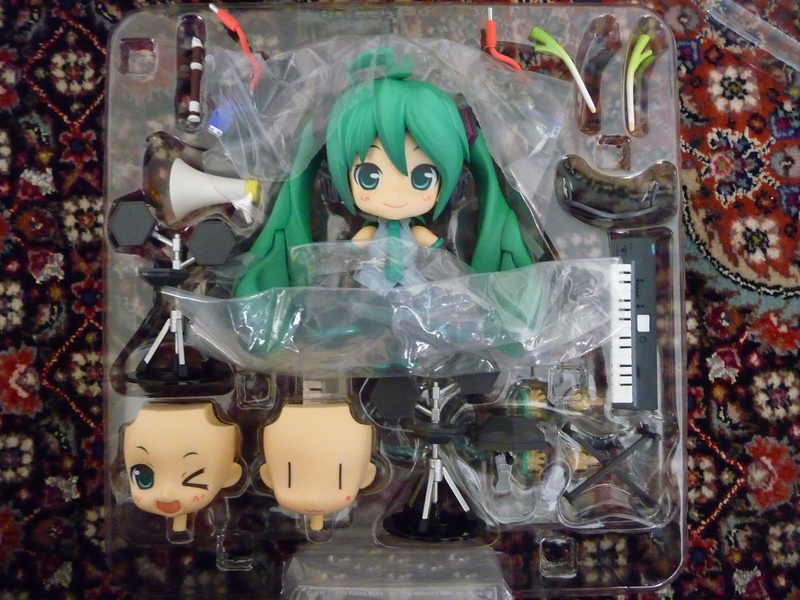 Its just the typical Play Arts box. Flat black in color, with circle tape! Also, the font that says final fantasy : advent children (or something similar to that) is in small silver letters, and the viewing window is rectangular with nothing blocking it. If the font is big and the carboard that the font is on blocks part of the viewing window, then its probably a bootleg (for better visualization of a bootleg AC box look at my vincent review). I may still post box pics in the future. 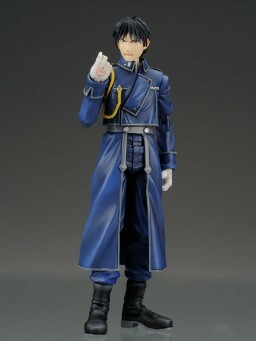 Accessories: He comes with a typical Play Arts stand, a bunch of extra hands, most of which can hold his weapon, and his weapon (the baton). 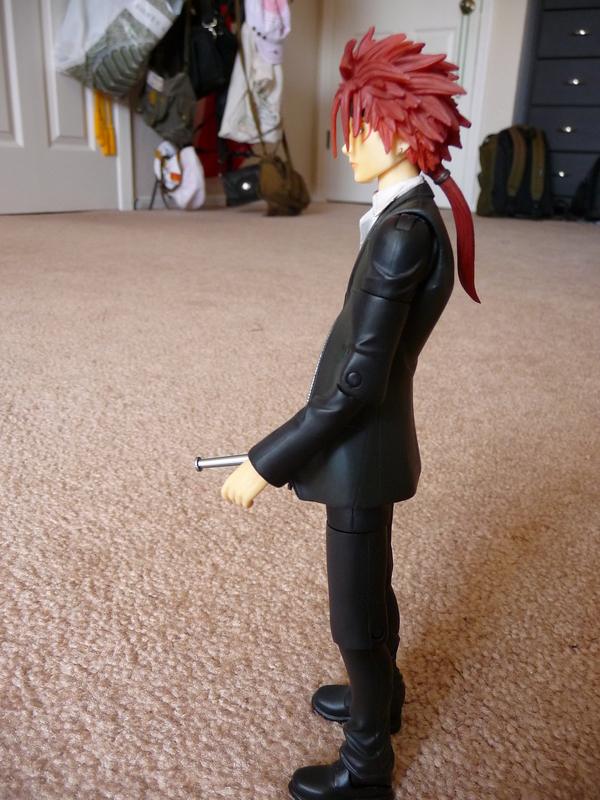 The baton has the same type of weapon grip style as the kingdom hearts toys. 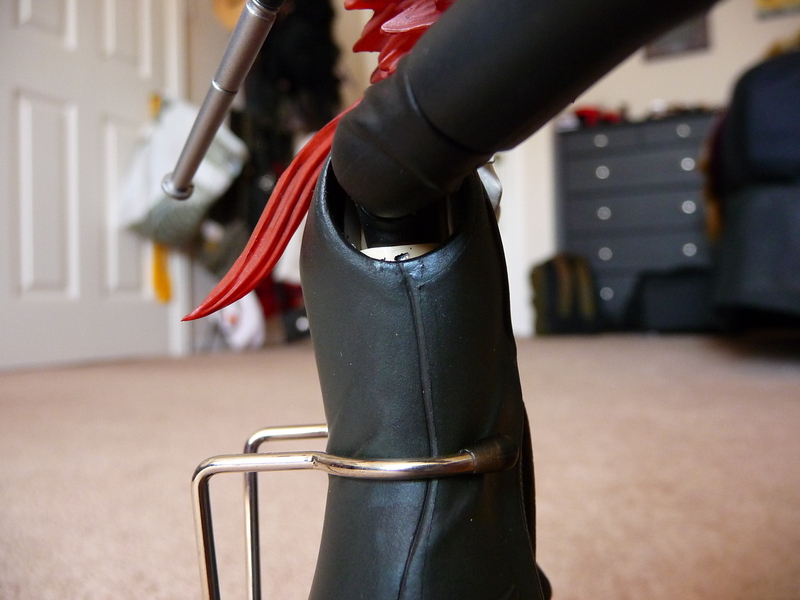 There is a hole in the handle of the weapon through which the peg on the hand is inserted. I prefer the hands that simply wrap around weapons. 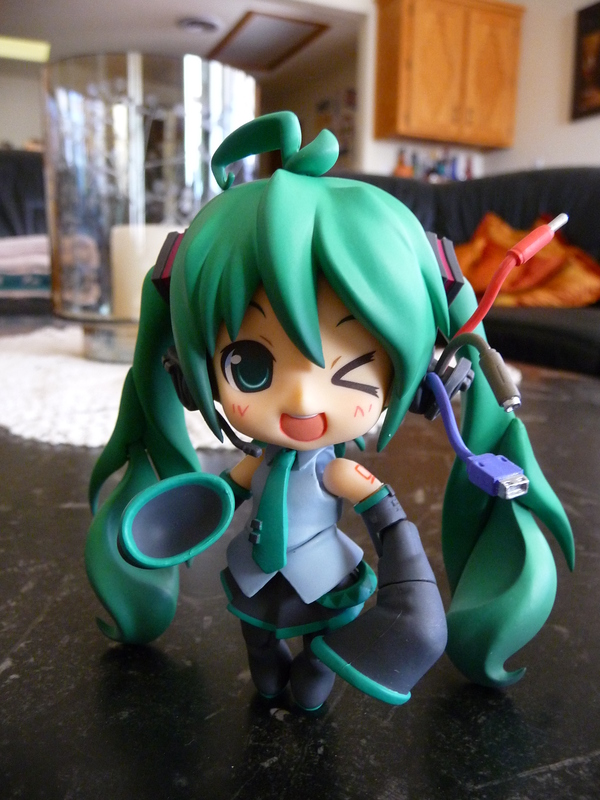 Sculpt: The sculpt on this toy is excellent! 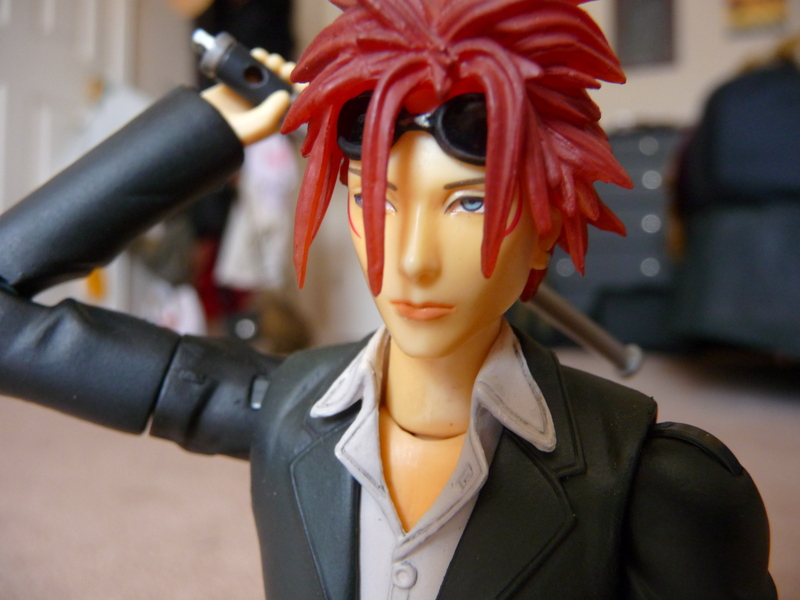 His hair is great and not too chunky! 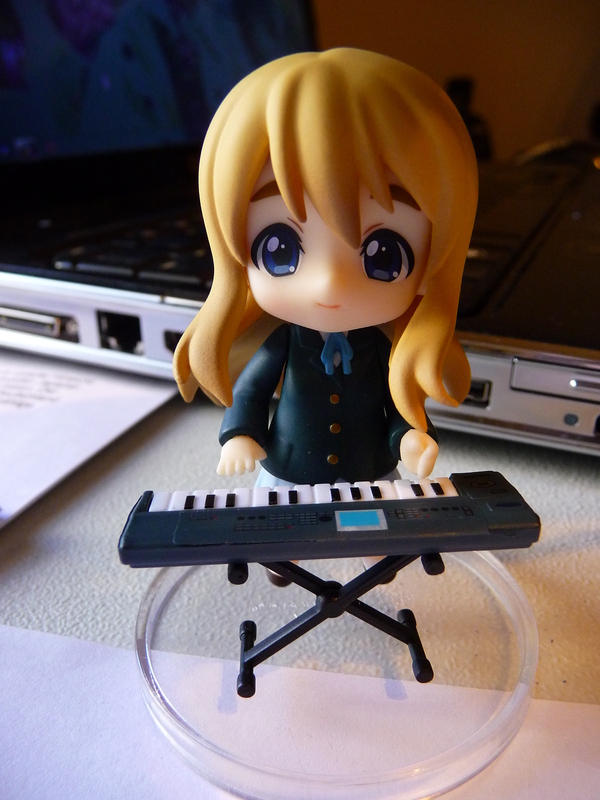 It is also made of a soft plastic so it was a little bit of give. 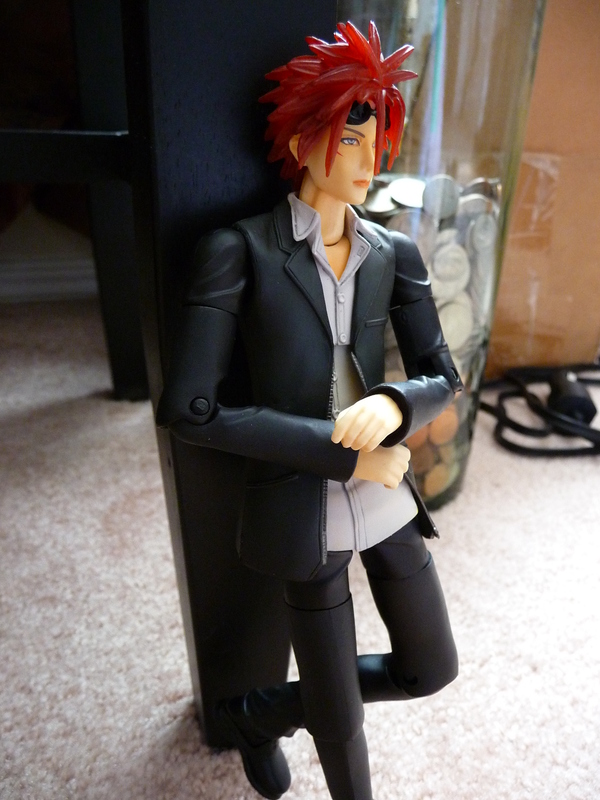 His jacket is likewise made of a soft plastic. 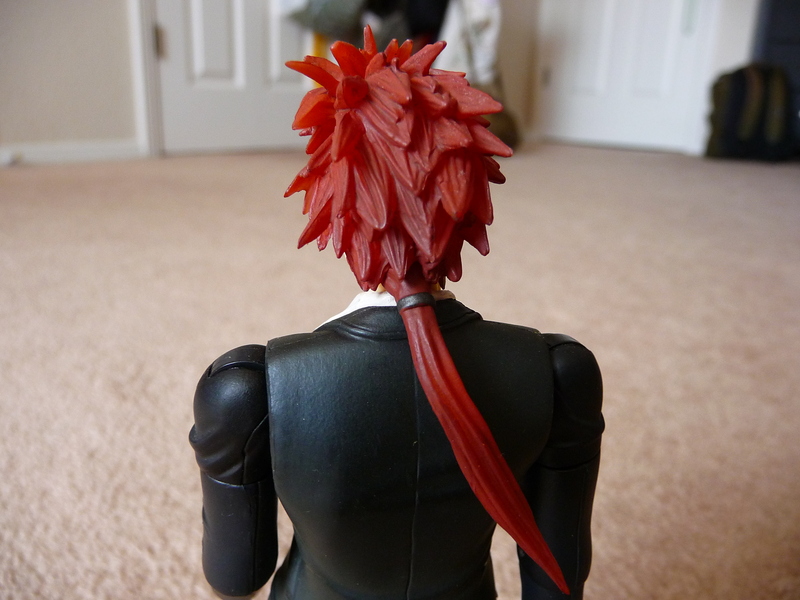 The only bothersome parts of the sculpt are that there is a gap where his arm connects to the jacket body… Also the gap where his head had to be force back on (I assume most wont have this particular problem). 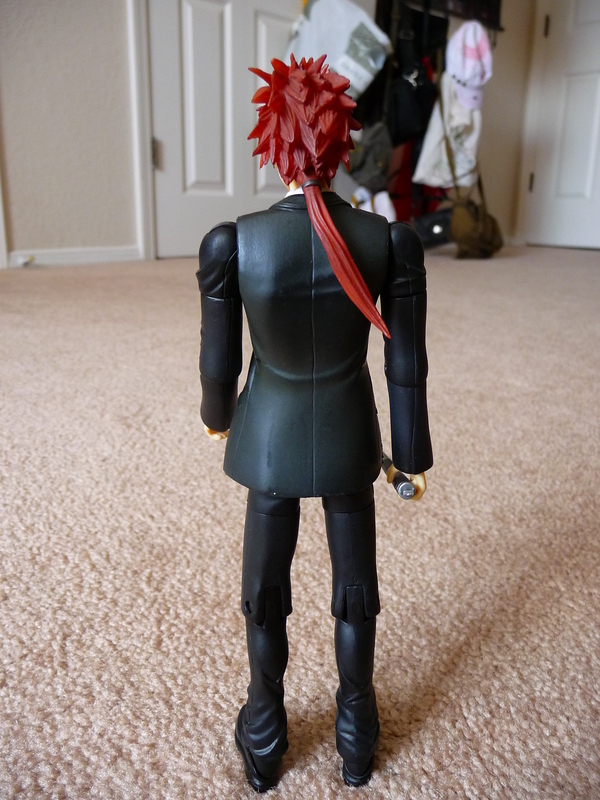 Some of the joints, like the one in his torso, look a bit awkward, but that is to be expected of Play Arts. 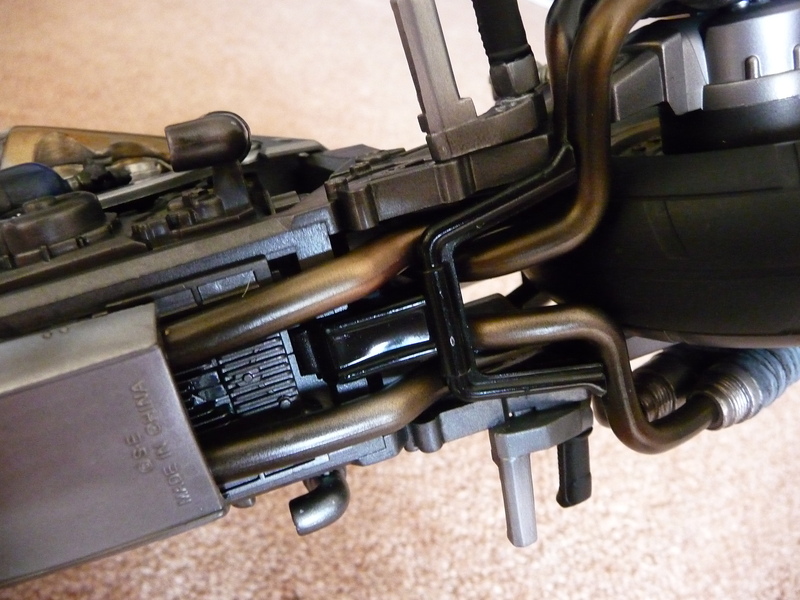 Paint: The paint on this toy is typical for Play Arts. 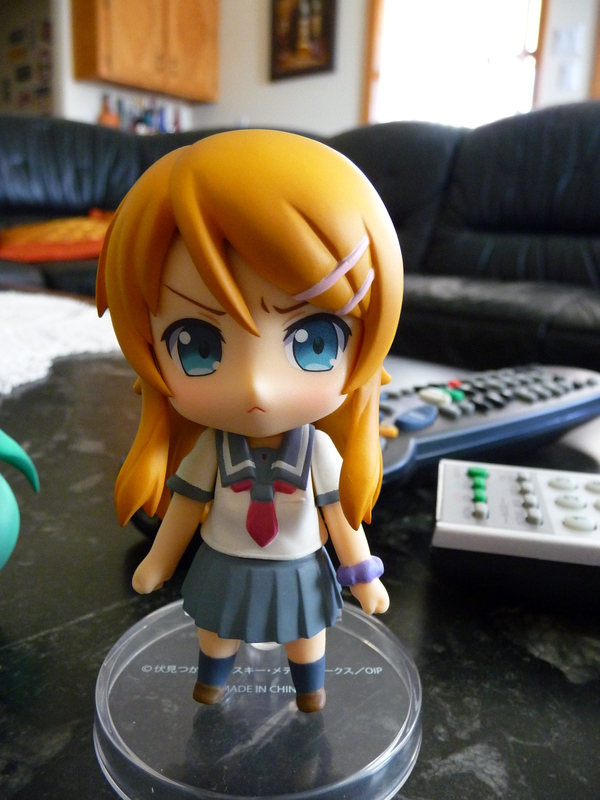 High quality, great face, but a few flaws here and there. 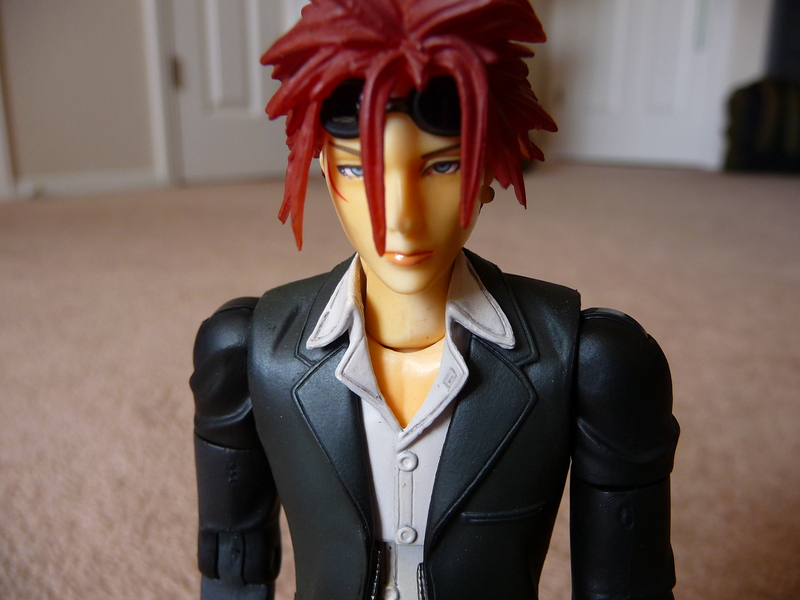 There are no paint smudges or bleeds on the figure at all, but there does seem to be some staining on his shirt. 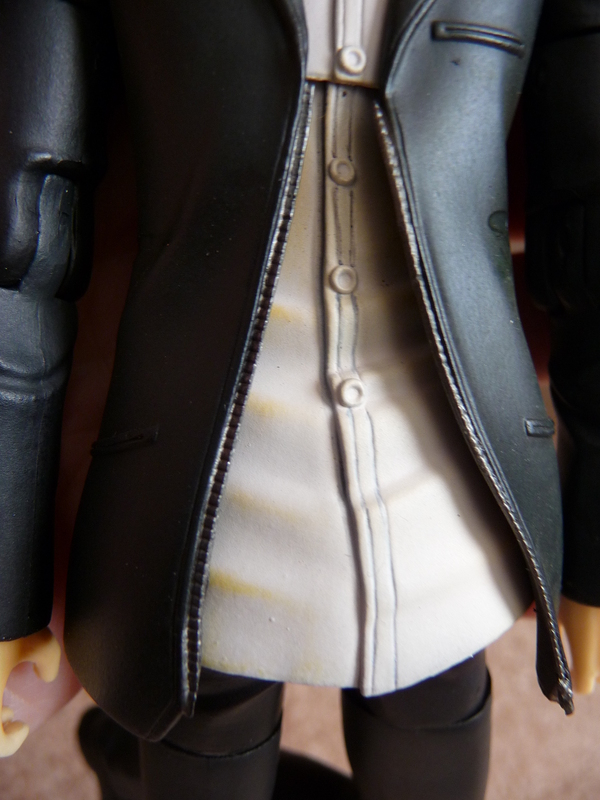 His shirt is stained slightly yellow, could it be from the jacket rubbing against it for so long? 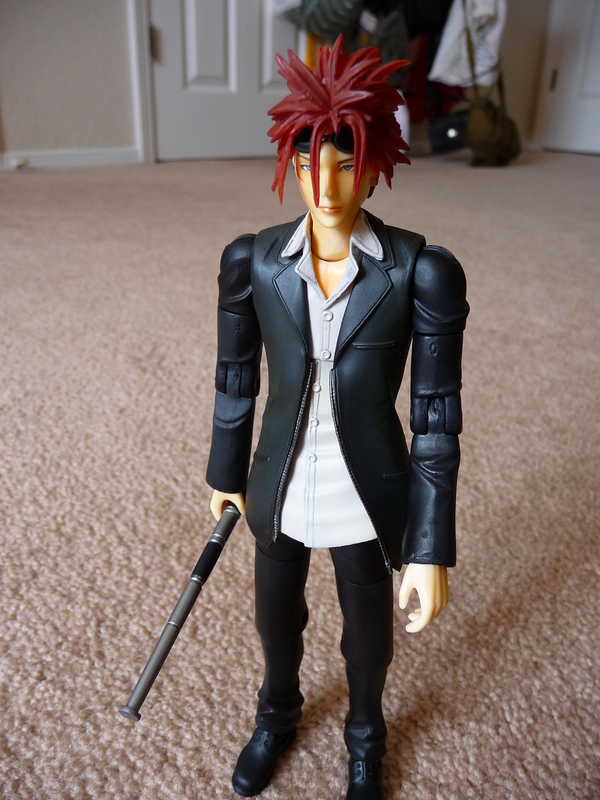 Poseability: Ok this Play Arts is seems alot more flexible than my other final fantasy ones (not including the Play Arts Kai line). Don’t get me wrong, he CANT be place into any pose imagineable, but compared to say Sephiroth or Cloud, he has a wider range of movement. 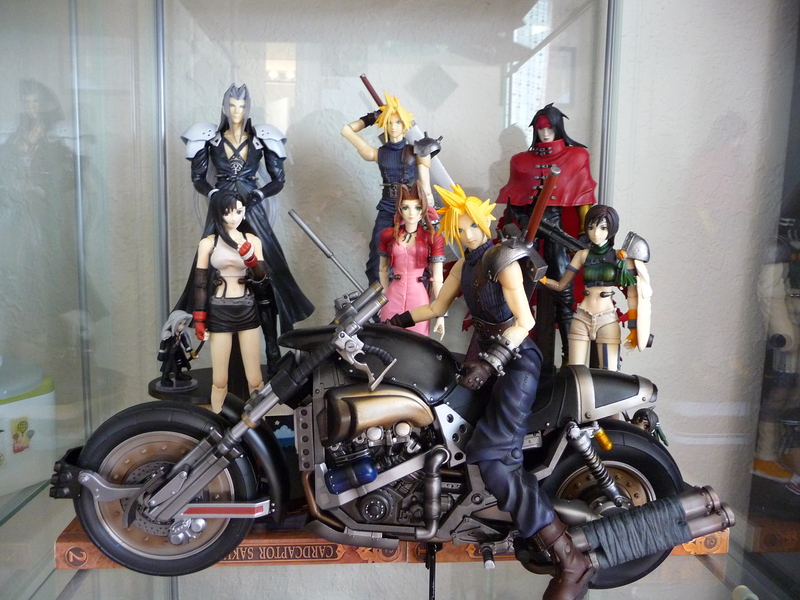 Overall: This is a really nice figure for big fans of FF7 (which I am), fans of Reno, or people who can’t rest until they own all the figures in a set (sometimes I fall in this category also). However, for those who dont fit into the above three categories, I’d say pass. 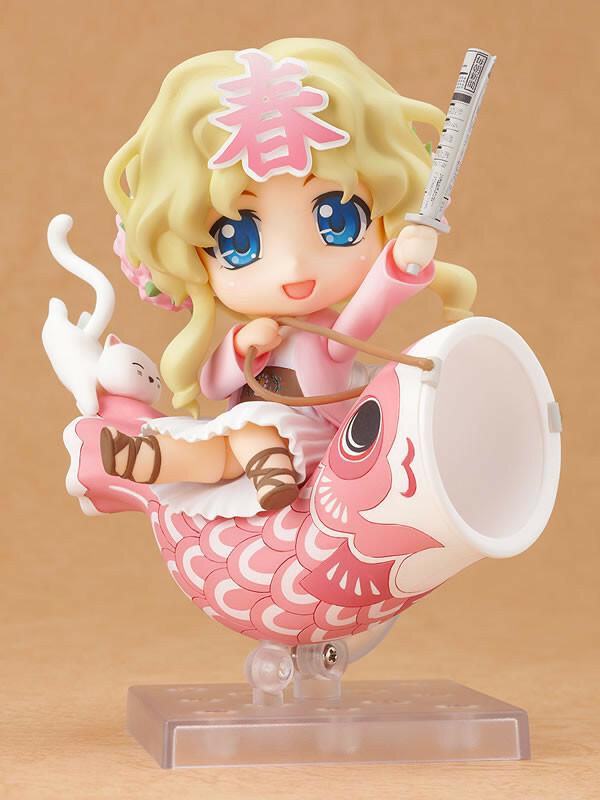 Spring Break Loot / New nendoroid photos! 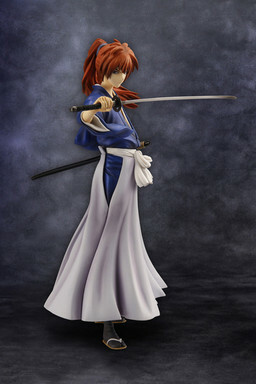 As far as life goes, well I’m sure we all know about the tragic earthquake and tsunami in Japan. My prayers, thoughts, and hopes go out to them. I’m proud to say that my university’s Japan club raised $2000 and made a thousand origami paper cranes to send to Japan for the relief effort! 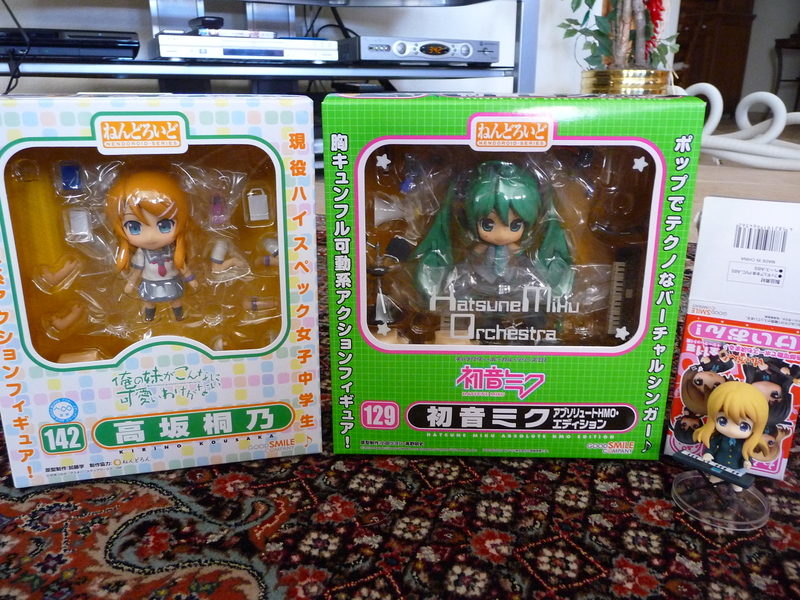 I haven’t bought any new toys lately, partially because of a lack of money but mostly a lack of time. 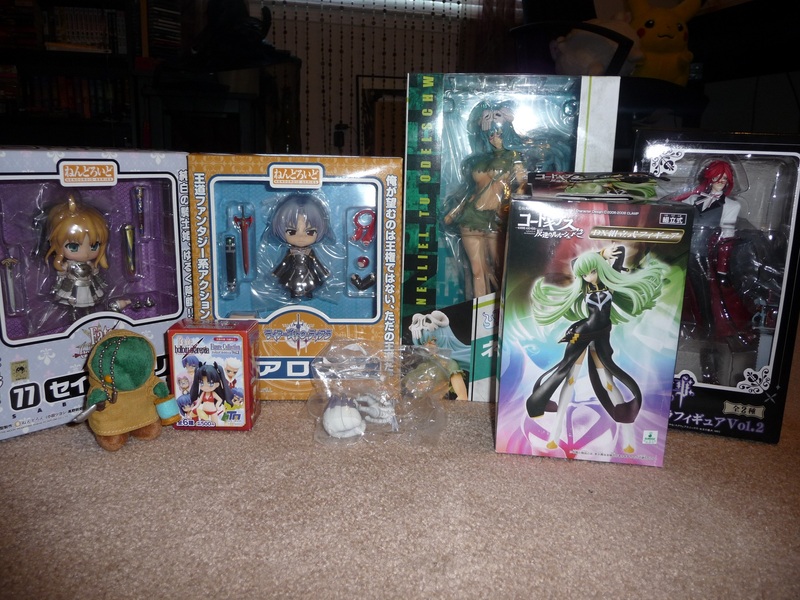 The only anime store around is about a hour and half drive away. 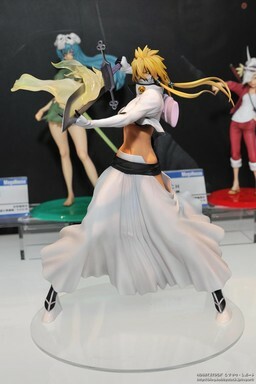 I do hope to buy some new toys during this spring break, and I have a huge list of must have releases for the summer which I may post about later. Since I got a rejection letter from medical school, I will be spending my summer studying to re-take the mcat, so I’m sad to say that I will probably not be going to the anime convention A-kon this summer =( I went last summer and it was fantastic, especially the dealer’s room! 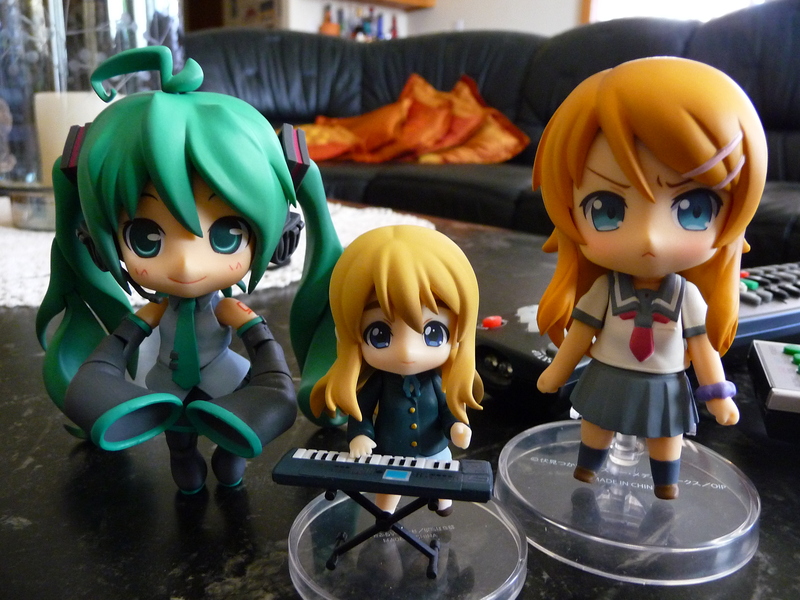 Though watch out for bootlegs, I know I saw a few last year, despite the con’s anti-bootleg policy. 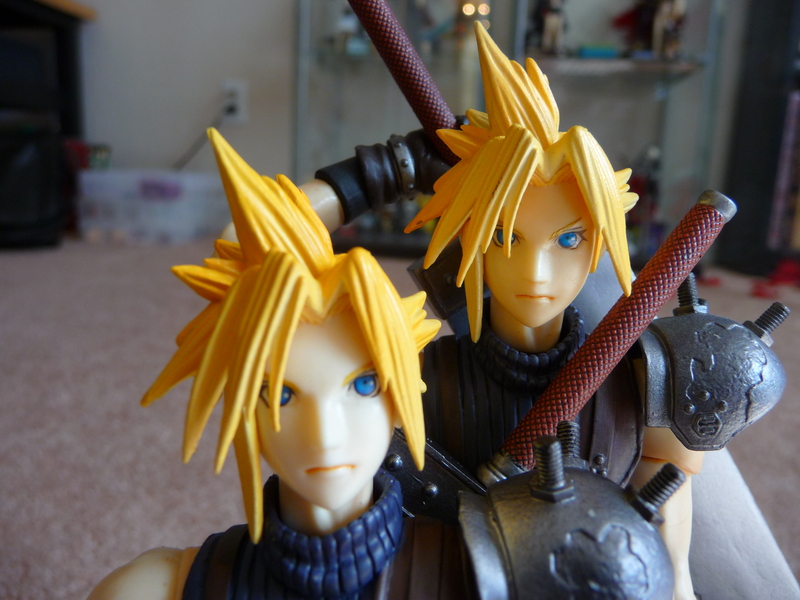 Cloud and Hardy Daytona Play Arts Review! 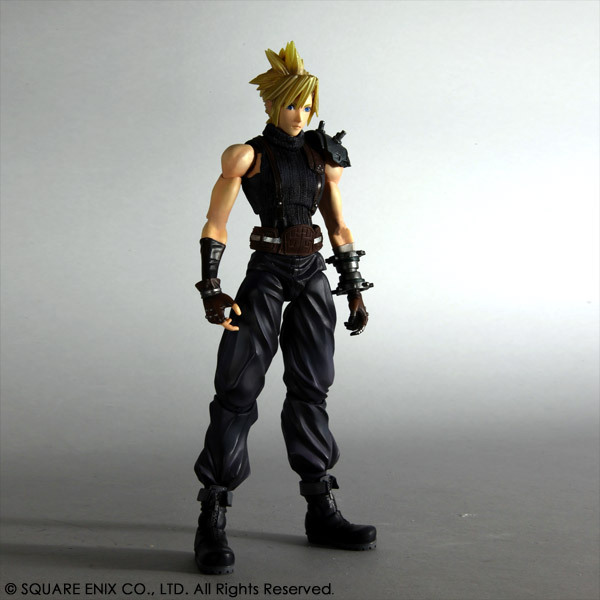 Cloud is the main protagonist from Final Fantasy VII. 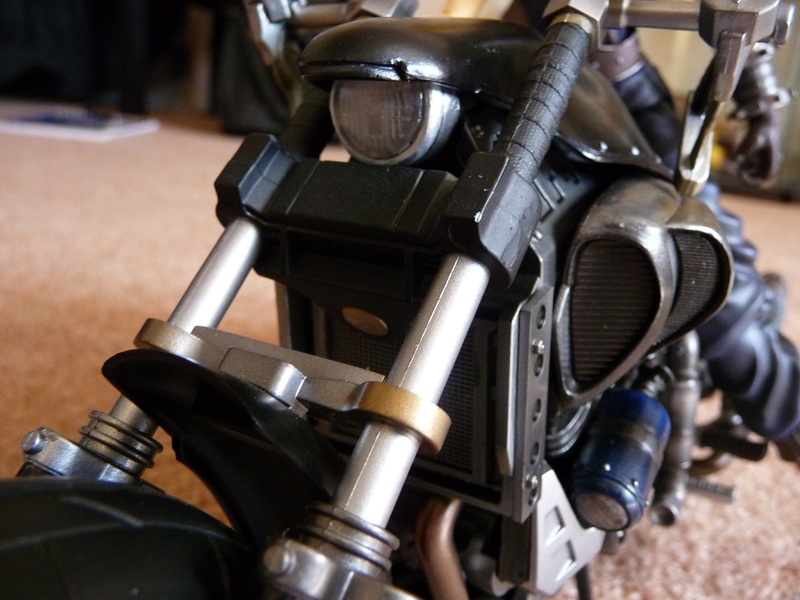 Towards the beginning of the game he rode a motorbike called the Hardy Daytona to escape from Shinra. 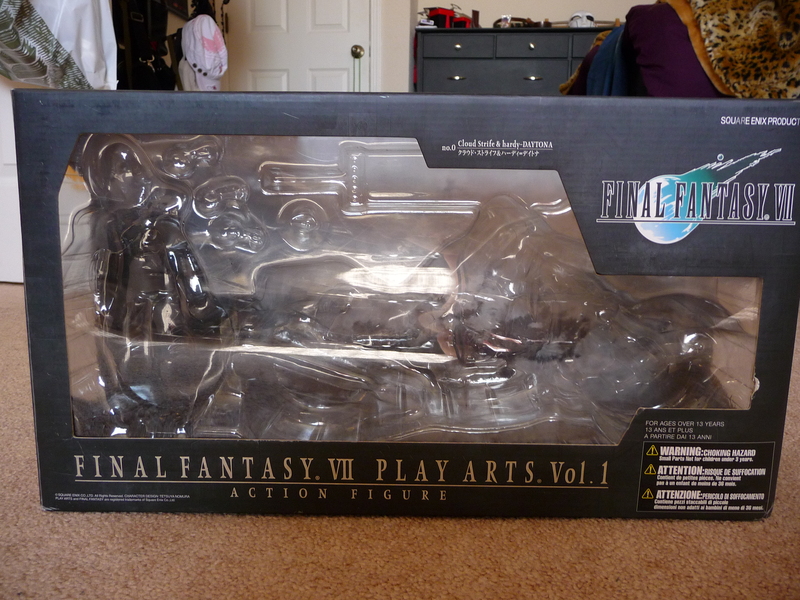 I got this Play Arts for my birthday this year! 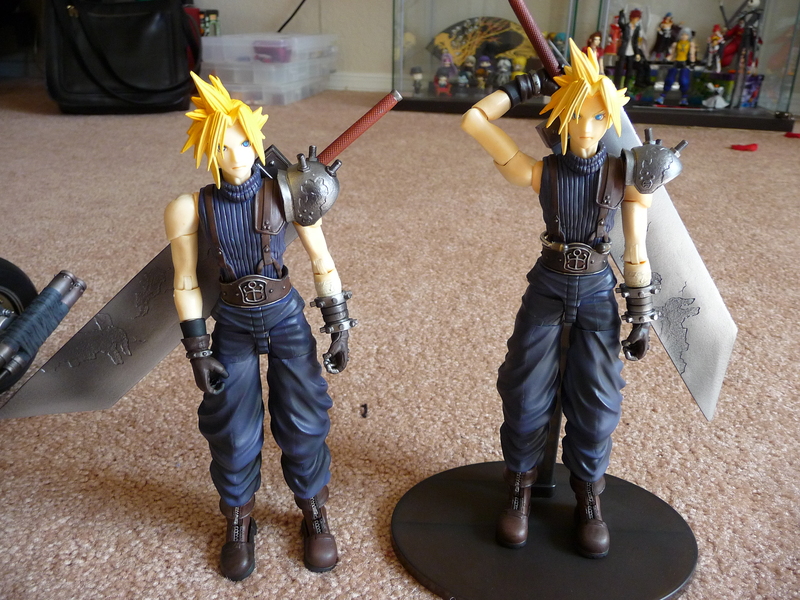 It is the Play Arts n.0 Cloud and Hardy Daytona produced by Square Enix and originally released in 04/2008.This review will mostly be about the Hardy Daytona, since the Cloud is very similar to the regular Play Arts Cloud. 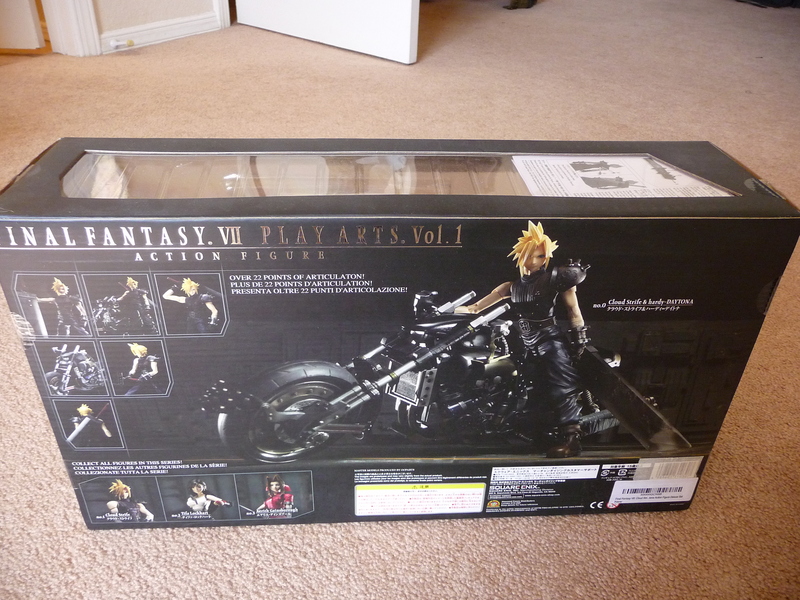 Box: This is a huge box, but other than that has all the typical features of a Play Arts box, like circle tape. 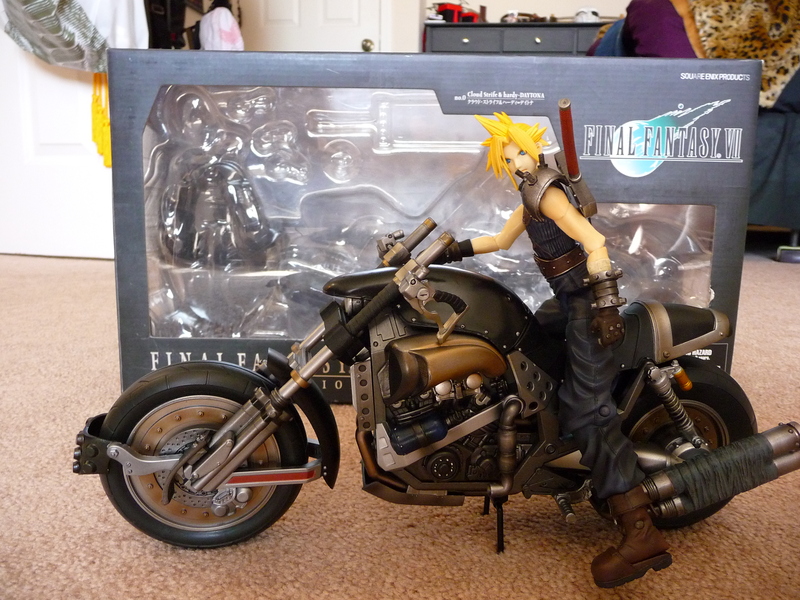 Accessories: Well the box has a Cloud, the Hardy Daytona, a normal play arts stand for the cloud, his buster sword, the same hands as regular cloud, and an extra set of hands to hold on to the bikes handle bars. 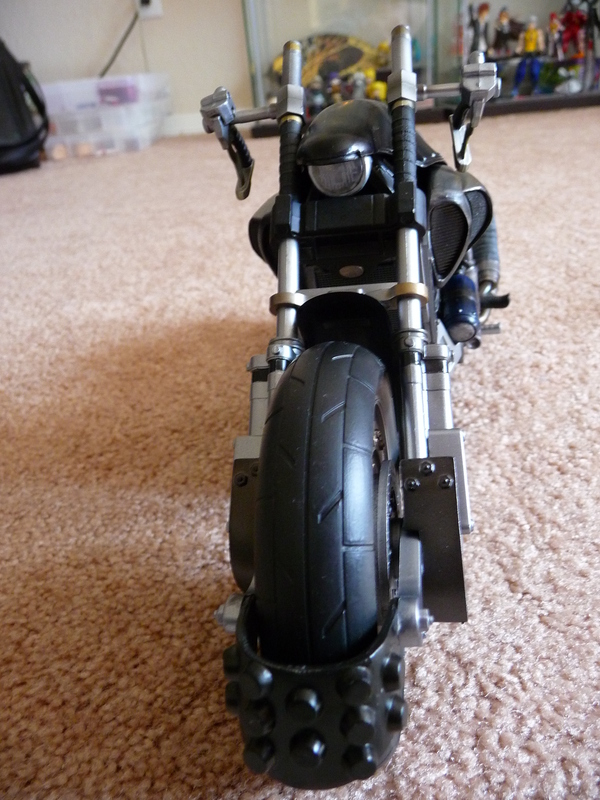 There are more accessories than usual, but I can’t seem to get the bike handle hands to actually hold on to the bike! am I doing something wrong? 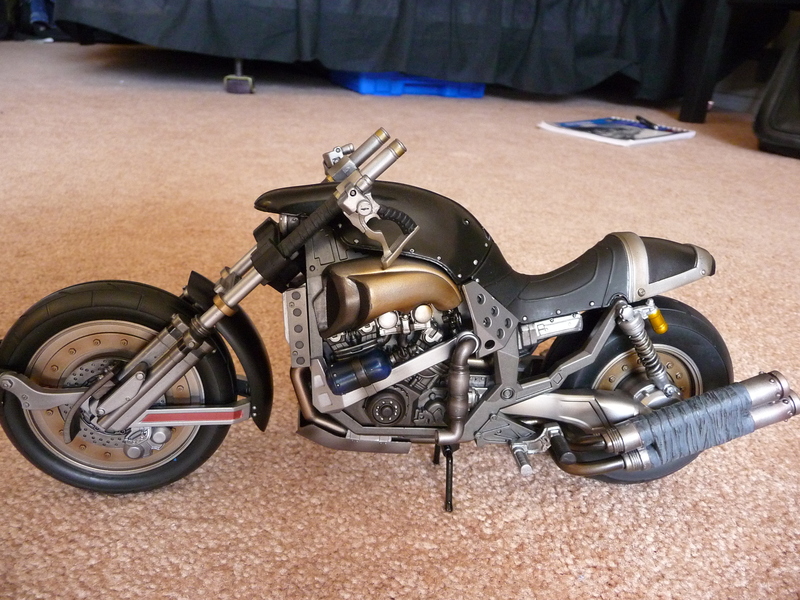 Sculpt: The bike is absolutely awesome! 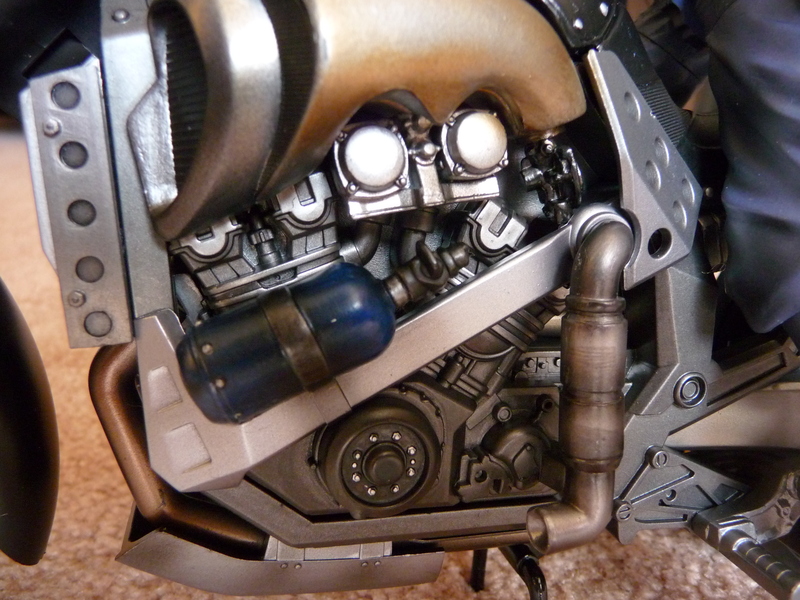 It is very detailed in every aspect of the sculpt, has working shocks, a kick stand (that folds) to help it stand up, and turning tires. 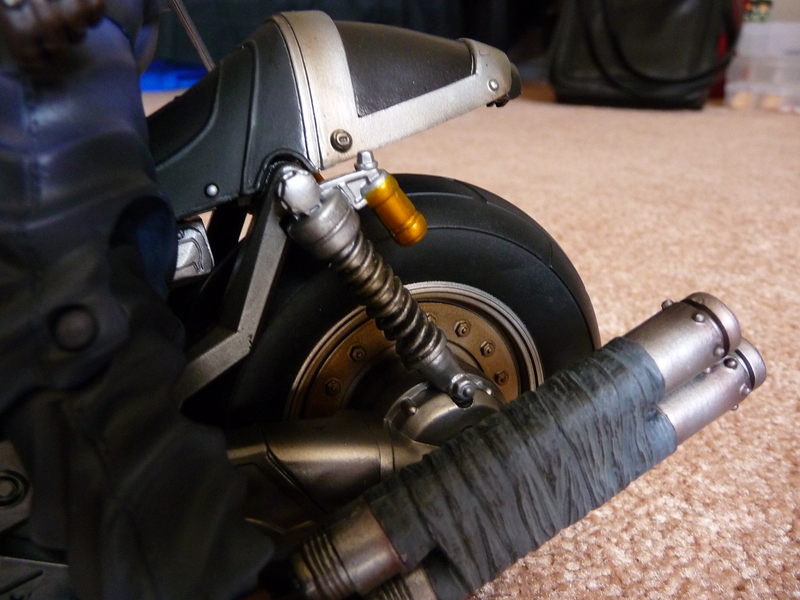 The tires are made of a soft rubber which makes them realistic and even have tread marks. 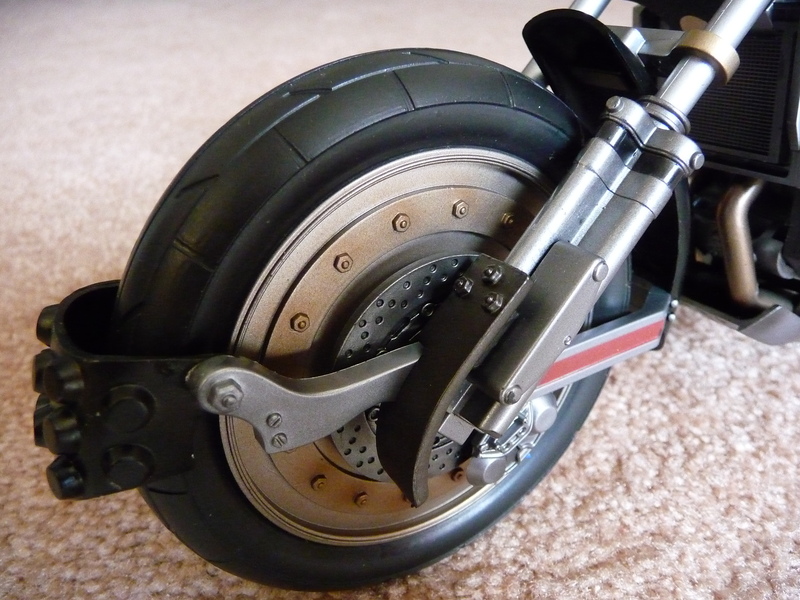 The bike handles themselves do not turn very much! 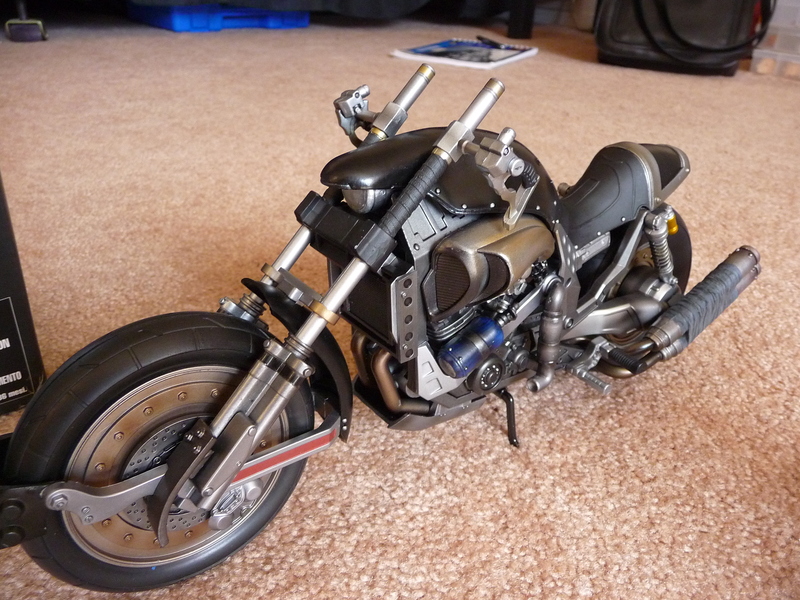 Paint: The paint job on this bike is fantastic. There are no bleeds in the paint. 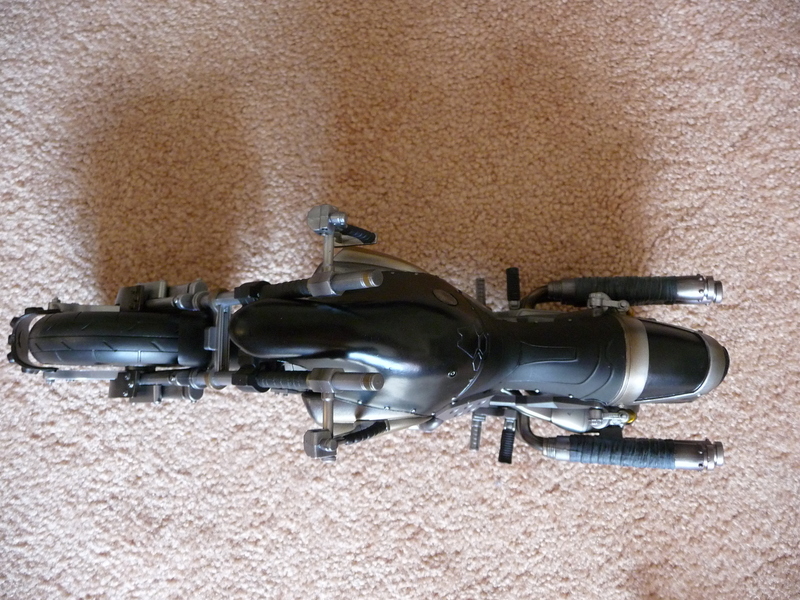 Pose-ability: Well the bike can either be posed by itself using the kickstand, or with Cloud on it. 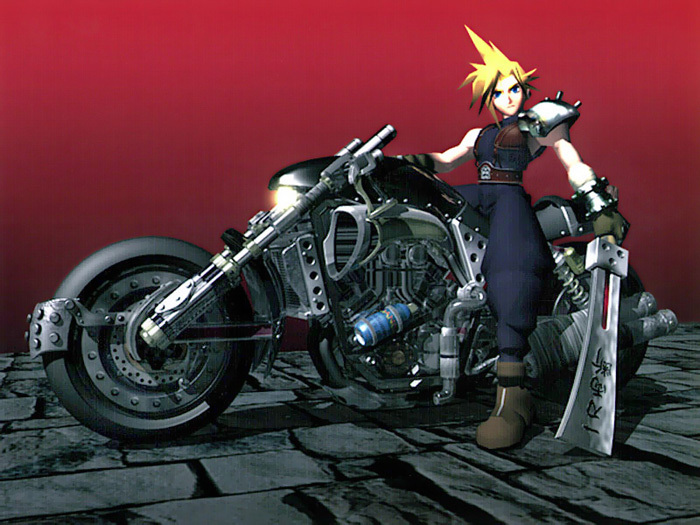 Here I should mention that this Cloud is alot more flexible than the original Cloud because his legs spread wider to allow him to sit on the bike. 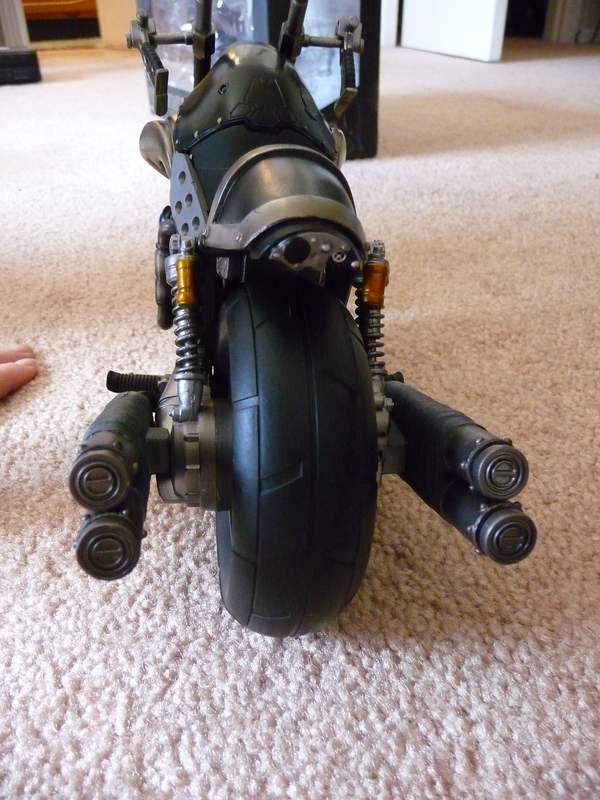 As mentioned above, the handle bars dont turn much. Cloud Comparison: The Cloud’s are supposed to be pretty much the same but they look slightly different.The bodies of the two Clouds looks identical, the difference is in the heads. Hd (hardy daytona) Cloud has taller and yellower spiky hair than normal Cloud. Hd Cloud also has paler skin and a slightly different face paint! 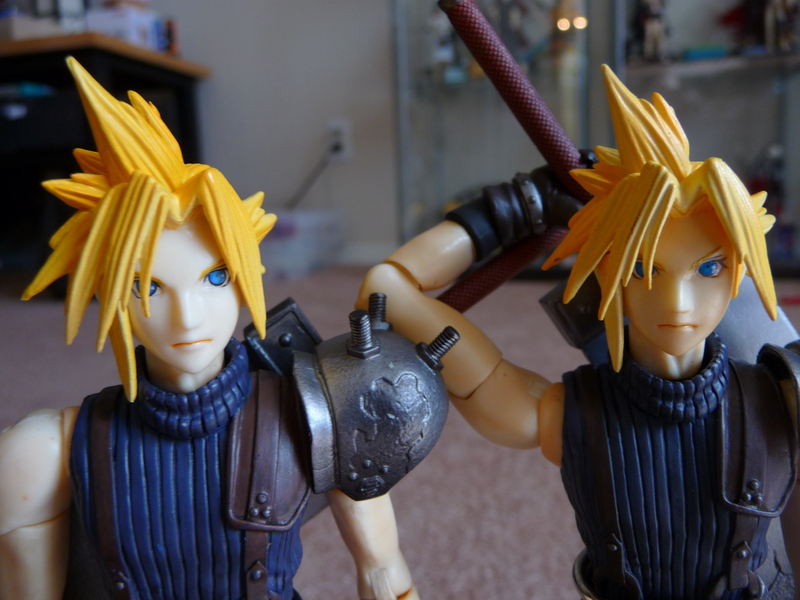 Hd Cloud is on the left, and regular Cloud is on the right. 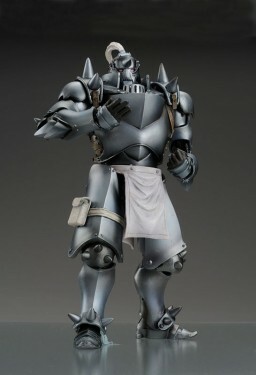 Overall: This is a must have for any FF7 fan. 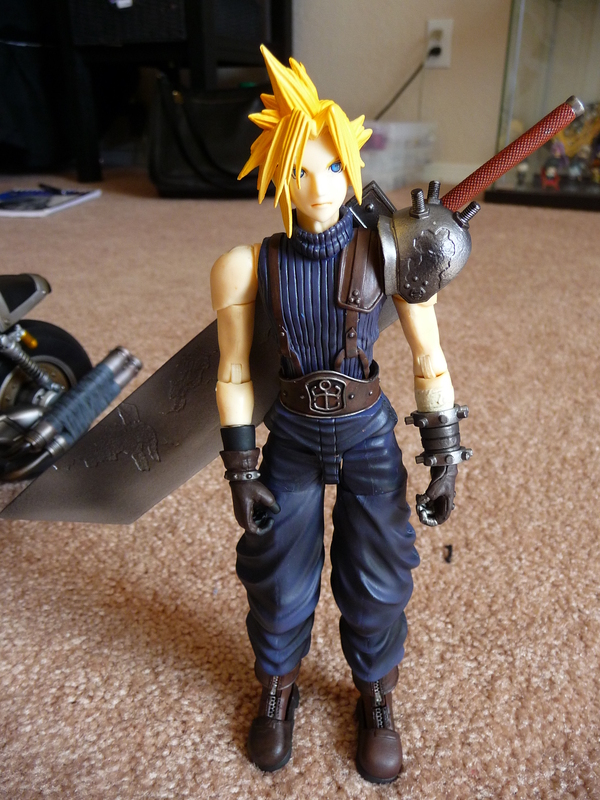 I would recommend getting this Cloud and Hardy Daytona over just getting the regular Play Arts Cloud. 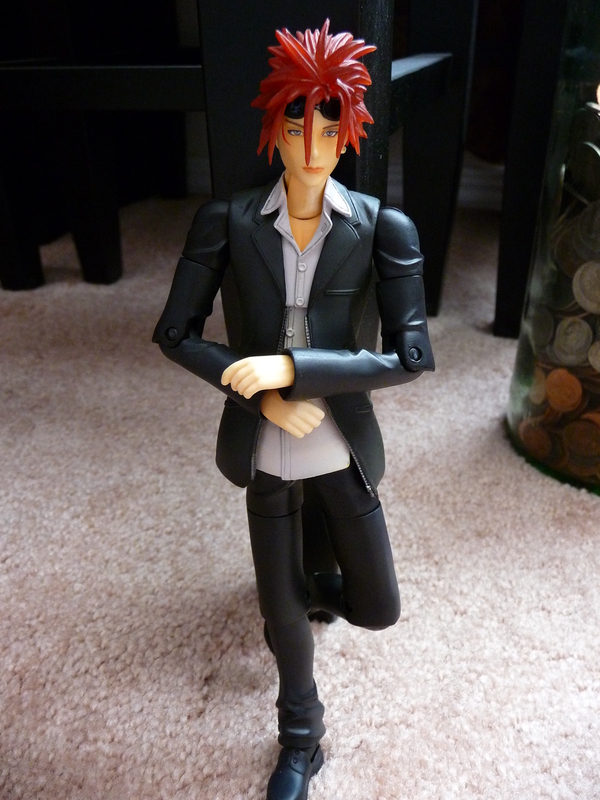 This one is more fun to play with, more handsome, and looks awesome on a shelf. 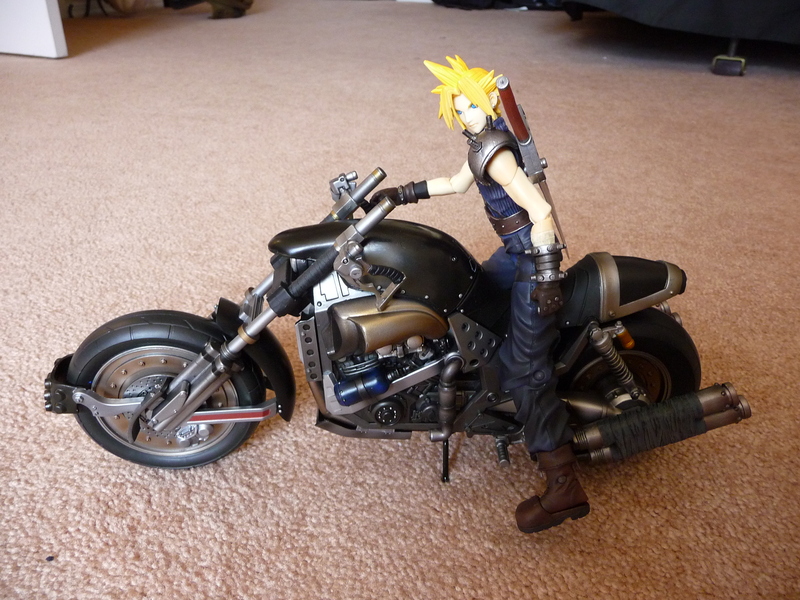 The only bad thing about this figure is that Cloud doesn’t fit onto the bike perfectly. His hands cant hold the handle bars easily and his feet don’t seem to fit into the foot peddles.